Typically, the human body is made of 206 bones, all of which are of different shapes and size. Among these, there are about 22 bones, which are found in the skull, while there are 33 spinal bones that bear its own special functions, including the neck of the human body. The head and neck bones play an essential role in supporting the brain, sensory organs, nerves, blood vessels of the head and also protecting all these structures from any kind of damage. Movements of head and neck bones by the attached muscles of the head provide for facial expressions, eating, speech and movement of the head. Attachment points for the muscles of the head and neck are located on the exterior surfaces of the skull that allow vital movements like chewing, speech and facial expressions. The upper portions of the digestive and respiratory tracts are also housed within the hollow oral and nasal cavities of the skull. Let’s discuss these two terms in detail. The cranial is the cranium that encloses the brain and acts as a protective case for the brain. The skull encases and protects the brain as well as the special sense organs of vision, hearing, balance, taste, and smell. It is an unpaired bone of the skull which contributes to the medial wall of the orbit. This medial wall consists of the nasal cavity and nasal septum. It is an unpaired bowl-shaped bone that is located in the forehead region. The frontal bone contributes to forming the cranium and it lies superior to the nasal bones and anterior to the parietal bones. It is a single bone consisting of four parts that surround the foramen magnum. These four parts are the basilar part, lateral part (internal and external surface), squamous part. It is located on each side of the skull behind the frontal bone and helps in forming the cranial roof and sides of the skull. This bone is of a quadrilateral shape having four angles, four margins, and two surfaces. It is a single bone that lies in the base of the skull that is between the frontal, temporal and occipital bones. The main parts of the sphenoid bone are Body of sphenoid, lesser wings of sphenoid, greater wings of sphenoids and pterygoid process. It is a paired bone located at the base and lateral side of the skull. It features an important structure of the vestibulocochlear apparatus that includes the external acoustic meatus, the tympanic cavity, and the structure of the inner ear. It is a paired bone in a form of a horizontal curved plate that is located in the lateral part of the nasal cavity. It helps in separating the middle nasal meatus from the lower nasal meatus. It is the smallest and thinnest paired bone of the skull that lies into the medial wall of the orbit. It has four borders and two surfaces. It is the only movable cranial bone that is connected to the skull through Temporomandibular joint. It consists of mainly two parts Body of mandible and Ramus of the mandible. It is also called an Upper jaw bone which has a body and four processes that include Frontal process, Zygomatic process, Palatine process, and Alveolar process. It is a thinned paired bone that is included in the forming of nasal and oral cavities and in pterygopalatine fossa also. The two plates of palatine bones are Horizontal plate and Perpendicular plate. It is an unpaired midline bone that along the perpendicular plate of the ethmoid forms of the nasal septum. 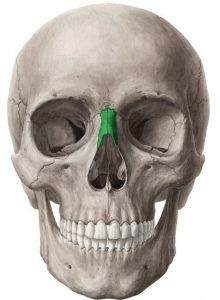 It is located in the sagittal plane that helps in forming the part of the inferior part of the nasal septum and the perpendicular plate of the ethmoid bone helps in forming the superior parts. It is a paired facial bone that is located in the upper lateral part of the face which helps in forming the prominence of the cheek. It also helps in forming the plate of the orbits. It is a paired bone that helps in forming the anterior wall of the nasal cavity that is responsible for the shape of the nose. The nasal bones are different in size and form in every individual. it is a single “U” shaped bone that is located in the interior part of the neck, between the chin and the thyroid cartilage. It has mainly three components that are Body of the thyroid, Lesser horn, and Greater horn. Above is the anatomy of the head bones, now it is time to discuss the anatomy of the neck bones. It is the most superior vertebra in the spinal column which plays an important role in supporting the skull, spinal cord, and vertebral arteries and also provides attachments points for several muscles of the neck. It is situated at the top of the neck, inferior to the condyles of the occipital bone and superior to the C2 vertebra. It is the second uppermost vertebrae making up the backbone. It helps the head to rotate from its support atop the C1 vertebrae where the skull attaches to the neck. It is located just below the Axis that is 2nd cervical vertebra within the neck. It consists of two parts that are a vertebral arch that protects the spinal cord and the ventral body which provides strength, protection, and mobility to the spinal column. It is 4th and the smallest from all of the 7 cervical vertebrae. It helps in allowing smooth articulation of the spine that is cushioned by intervertebral discs. It is smaller and more flexible vertebrae that help in protecting and supporting the spinal column while allowing smooth movement of the backbone. 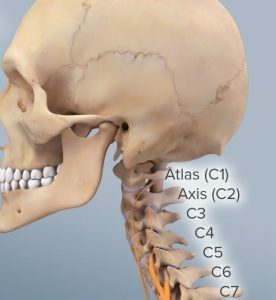 It is located in the base of the neck between the C5 and C7 that plays a crucial role to support and protect the structures of the head and neck. It also helps in anchoring of muscles that help in moving and supporting the neck. C7 is the biggest and most inferior vertebrae in the neck. It has a large spinous process to protrudes posteriorly towards the skin at the back of the neck. It is located below the 6th cervical vertebrae and superior to the first thoracic vertebra. Clavicle – It is also known as collarbone that is a long, thick bone located at the base of the neck. It helps in holding the arms freely, supported, and away from the trunk. Humerus – It is a long bone in the upper arm that is situated between the elbow joint and the shoulder. It helps in supporting all lifting and physical activities. Scapula – It is also known as the shoulder blade that connects the humerus bone of the arm to the collarbone. The three muscles that are responsible for the movements of the shoulder blade are Trapezius muscle, Levator muscle, and Rhomboideus muscle. Sternum – It is also known as the breastbone which is a flat bone at the front center of the chest. It is made up of three parts that are Manubrium, the Body, and the Xiphoid process. Hollow spaces within the cervical vertebrae protect and conducts the spinal cord as well as the vertebral arteries through the neck. Muscle attachment sites on the cervical vertebrae provide movement and posture on the head and neck. The neck certainly has a great deal of responsibility, such as that of supporting the head to include the spinal cord and nerves as they emerge from the skull. The neck has the ability to support weight as well. The human head and neck bones are crucial for structure and support. The muscles of the neck provide the mechanism for swallowing, yawning, speaking and moving the head. With the weight that must be supported, these muscles are strong. However, the muscles of the neck can also be easily strained or injured. The injuries may occur through repetitive use, or through immediate injuries, such as when playing sports and doing other activities. The neck is quite a complex structure with seven cervical bones, it has a great ability for flexion, extension, and rotation. The bones that make up the neck are responsible for support and structure along with protection of the spinal cord as it exits the skull. On the other hand, the head bones are crucial too as they provide us facility of expressions. Without it, we would never imagine how hard our lives can be.